See the letter posted on the website above. The official website has been overrun and will not load. 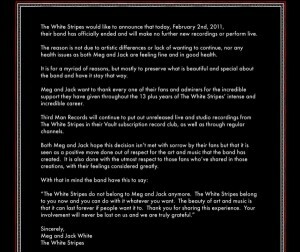 This entry was posted in Breakup/Reunite, News and tagged breakup, white stripes on February 2, 2011 by Dave. Now, not to make any assumptions because he already claimed his Jay-Z collaboration Watch the Throne was due in a week in early January, but still. He did it in CAPS LOCK and everything. And by summer, new solo album? This could be the busiest release schedule of all time. OF ALL TIME. 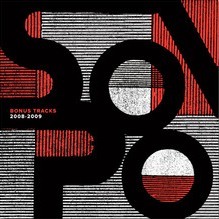 This entry was posted in New Albums, News on January 23, 2011 by Dave. Reznor, Ross, and Fincher will also be working together to score the American adaptation of Steig Larsson’s <em>The Girl With the Dragon Tattoo</em>, which is due out in December of this year. This entry was posted in News and tagged atticus ross, golden globes, the social network, trent reznor on January 16, 2011 by Dave.